13 Above: Top 20 Things You Didn't Know About ... Genius ! Top 20 Things You Didn't Know About ... Genius ! How do the Nobel Prize winners get so damn smart? 1. 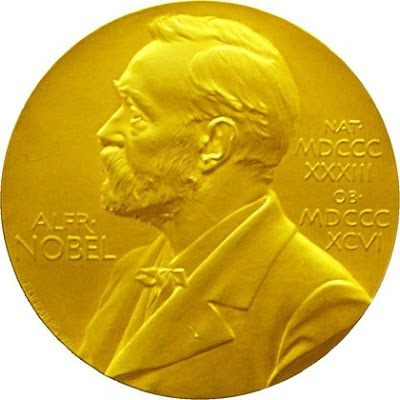 The latest winners of the Nobel Prizes -- the big kahuna of genius awards -- will be announced October 5 this year. Were you nominated? To find out, you’ll have to either win or wait 50 years, which is how long the Nobel committee keeps secret the list of also-rans. 2. Nyah, nyah. William Shockley, who won the 1956 Nobel in physics for inventing the transistor, was excluded as a child from a long-term study of genius because his IQ score wasn’t high enough. 3. History repeated itself in 1968 when Luis Alvarez won a Nobel for his work on elementary particles. He had been excluded from the same research program as Shockley. Who set up that study, anyway? 4. The genius study was created in 1928 by Louis Terman at Stanford University, who pioneered the use of IQ tests to identify geniuses, defined by him as those with an IQ greater than 140. 5. None of the children (known as “Termites”) in the study has won a Nobel. 6. Still smart, though: Termite Jess Oppenheimer invented the TelePrompTer, and Norris Bradbury headed the Los Alamos National Laboratory. 7. Many 19th- and 20th-century creative geniuses acquired a reputation for promiscuity. Examples include Richard Feynman, Albert Einstein and Bertrand Russell. 8. One theory suggests that male geniuses are unusually endowed with enthusiasm for risk-taking, which is notoriously testosterone-linked. 9. In 1981 Shockley and eugenicist Robert Klark Graham cofounded the Repository for Germinal Choice in Southern California, a sperm bank dedicated to selling the seed of Nobel Prize winners and other men with a high I.Q. 10. Graham died in 1997. The Repository for Germinal Choice closed in 1999. 11. Being a genius is no guarantee of financial security. A recent study at the Ohio State University Center for Human Resource Research showed that baby boomers with average and low IQs were just as good at saving money as those with high IQs. 12. Albert Einstein is said to have lost most of his Nobel money in bad investments. Anyone can do that. 13. Hans Asperger, an Austrian pediatrician, identified what is now called Asperger’s syndrome: a form of autism marked by intense absorption in a very narrow range of special interests. 14. Asperger believed that there is a link between mathematical and scientific genius and his syndrome, claiming that "for success in science and art, a dash of autism is essential." 15. Sometimes stereotypes are accurate. Norbert Wiener, who invented the field of cybernetics, was the prototype of the absent-minded genius. 16. Once, Weiner forgot he’d driven to a conference, took the bus home, and then reported his car stolen when he didn’t see it in his driveway. 17. In the 1990s Bell Labs found that its most valued and productive electrical engineers were not those endowed with genius but those who excelled in rapport, empathy, cooperation, persuasion and the ability to build consensus. 18. Too much partying? In 2007 researchers at Kyoto University pitted chimpanzees against college students in three memory-based intelligence tests. The highest-scoring chimp beat all the students in the first test, tied with a few in the second test and reigned again in the third. 19. Try pitting him against the chimp. Alex, a gray parrot who died last September at age 31, has been widely billed as the smartest bird ever. Alex could identify 50 objects, seven colors and shapes and quantities of up to six. 20. You, too, can be a genius (maybe). Scientists at the University of Sydney and Macquarie University in Australia say intelligence can be boosted, at least in the short term, by a daily dose of 5 milligrams of creatine, a compound found in muscle tissue. NASA Planed To Save Future 'Armageddon' !! The Feel Good Factor In Human Life !! World's Most Hungriest Girl In Just 5... OMG !! The Best Nonsense Money Can Buy ! Famous Celebrities Under Huge TAX Burden !! Artificial Wonder - Amazing Paddy Arts !! Is This The Most Freakiest Bridge In World ?